Pour the milk and cream into a saucepan. Roughly bruise a large handful of the basil (including the stems) and mix into the cream and milk with the lemon zest. Set over a low heat and slowly bring to just below boiling point. Do not let the mixture come up to a full boil. Remove from the heat and leave to infuse for 30 minutes. Meanwhile, make the nectarine salad. Put 2-3 large sprigs of basil in a small saucepan with the sugar, 3 strips of zest pared from the lemon and the water. Place over a medium heat, stirring occasionally until the sugar has dissolved. Bring up to the boil and cook briskly for 10 minutes or until the mixture becomes quite sticky. Remove from the heat and mix in the juice of half the lemon. Quarter and destone the nectarines. Cut the fruit into fine slices and strain the warm (not hot) syrup over it. Set aside until needed. Put some ice and a little cold water in a large bowl and set aside while you make the custard for the ice cream. Whisk together the egg yolks and sugar until thick and creamy. Reheat the basil-infused cream and slowly pour into the egg yolk mixture as you continue to whisk. Pour back into the saucepan and set over a low heat. Stir continuously with a wooden spoon until the mixture thickens to the consistency of double cream and can coat the back of the spoon - this will take 5-10 minutes - then immediately strain into a bowl set over the bowl of iced water and stir until cool. Churn the custard in an ice cream maker according to the manufacturer's instructions. Alternatively, pour into a shallow plastic container and place in the freezer. Use a fork to mix in the ice crystals every 40 minutes or so until the mixture is set. 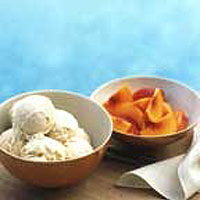 Serve scoops of ice cream with the nectarine salad.